This Maple Roasted Turkey with Sage and Bacon is accompanied by Cornbread Stuffing and is quite simply the best bird I’ve ever had. I’ve been making this Maple Roasted Turkey with Sage, Bacon, and Cornbread Stuffing for the last decade for our Thanksgiving dinner. As a matter of fact this post has been on my site for many years but it was more as a refuge for the recipe so I wouldn’t lose it. One quick photo of the finished bird while people were waiting to eat dinner did not really do it the justice it deserved so this year I decided it was high time to do it right and feature my most favorite turkey ever. I used to love changing up ingredients and doing something new each year with the holiday bird but then I did this recipe from an issue of Bon Appetit magazine and everything changed. The article was a charming tale of how Tyler Florence made this for the holiday with his son during a period when he found himself single again. Well, Tyler is no longer single but I’m still making this bird albeit with a few of my own twists. It is quite simply the most amazing and wonderfully flavored star of our Thanksgiving meal. I have no doubt that the first step towards the perfection of this bird is the bird itself. After years of buying my turkey frozen at the grocery store, I’ve found that Sprouts has fresh turkeys available and I love that I can buy a bird one day and have it in the oven the next. More of the things I love? The fresh sage that is still available from the garden in the fall that is added to butter for both the turkey and a fabulous cornbread stuffing (I might not stuff the bird but yes, I still call it stuffing!). I have a theory about why sage is so prevalent in our Thanksgiving star…it’s the one herb that doesn’t seem affected by the chilly nights that come with Fall; mine will stay alive until we get a really hard freeze in January. Or I should say my neighbor Amy’s will stay alive until then. I’ve yet to plant one and she’s been generous with hers; perfect right? While the bacon and the sage are both so important I honestly think the big huge secret to the success of this turkey is the use of maple syrup. I admit I had some trepidation myself at the thought of gravy with maple syrup but combined with the flavor of bacon and sage and turkey it is downright addictive stuff. There is no secret why cornbread is the perfect stuffing for this dish; imagine that maple goodness drizzled on top of cornbread. It is seriously an OH MY moment! How prophetic that I’ve been asked to work with The Federation of Quebec Maple Syrup Producers as a Brand Ambassador; this isn’t my only use for what I deem an elixir of the Gods. I have a profound love for all things maple and combining it with bacon and bourbon is something I’m known for. Those ingredients have peppered a plethora of recipes on this site and my fondness for maple syrup has been apparent for a long time so working with these folks is simply perfect. The Federation was founded in 1966 with the mission of defending and promoting the economic, social and moral interests of its 7,400 maple businesses; the men and women in this industry work together to collectively market their products. The quality of their work and their products has made Canada the producer of 71% of today’s global maple syrup output, 91% of which is produced in Quebec. Friends brought me that gorgeous bottle of syrup pictured above after a trip to Canada (see, everyone knows what I like!) but when a bottle was sent to me by my Canadian friends it was, lo and behold, a jug of the Kirkland brand from Costco. Filled with a metric amount I thought maybe that was only for Canada but no; I went to my fridge and pulled out my own jug and son of a gun…made in Canada! I also have a dear friend who lives in Canada; when asked what she could send me for a housewarming gift…well, really, do I need to tell you? I am maple syrup crazy! I have a lot to learn about maple syrup and thought this graphic from their site most interesting…I mean really…who knew? I had originally planned to announce my new affiliation with the Federation with a cookie that symbolizes my love of all things ‘maple syrupy.’ When I was a young girl and my mom was making assembly line peanut butter and jelly sandwiches for my siblings I was the rebel; I always insisted on a combination of peanut butter and syrup instead. Truth be told; I’m betting with six kids there was not a lot of REAL maple syrup in our home but still it was maple flavored and I loved it and I still love that sandwich. Once I was in charge of my own shopping choices, I made the switch to the real deal and there is simply no going back. So my big plans included concocting a sandwich cookie using peanut butter cookies with a maple syrup filling as a tribute to my devotion to all things maple for as long as I can remember. But then Thanksgiving came into view and I decided it was time to make this turkey and share it with you and I could think of nothing better than showcasing the beauty of my bounty in this way. It’s delicious and unique and simply unforgettable. I have never had one person enjoy this meal with us that hasn’t shared my love. 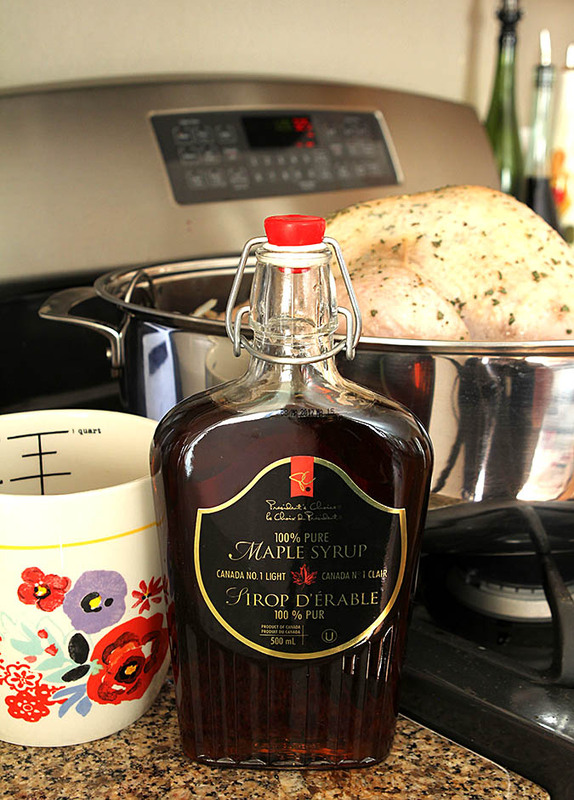 The maple syrup is the most surprising, most noticeable and most memorable component. Looks like I won’t be off the hook for making this meal for a long time…and that works for me! The cookie? No worries…next month just in time for holiday baking! The bird is smothered and stuffed with sage butter and then glazed every 30 minutes with the maple syrup. The first time I made it the syrup and fat combined in the bottom of my roasting pan and burned a bit so my first modification was to include pouring some chicken stock into the bottom of the roaster as it first goes into the oven. Not only did that prevent any burning but it’s my notion that the steam in the oven is just one more reason why this bird is so amazingly moist. Brining? Absolutely no reason to and I’m fine with that! The bacon is added during the last hour of cooking and I only use thick cut; anything else would get too dry. Even with the bacon, the maple glazing does not stop so at the end of the roasting period, those slices are slightly crispy and maple glazed and totally worth their weight in gold. There was a day when people fought for the roasted slices but I put an end to that; no one gets them! Half of them are chopped and put into the stuffing and the rest are put on the plate of carved turkey so everyone can have a slice. 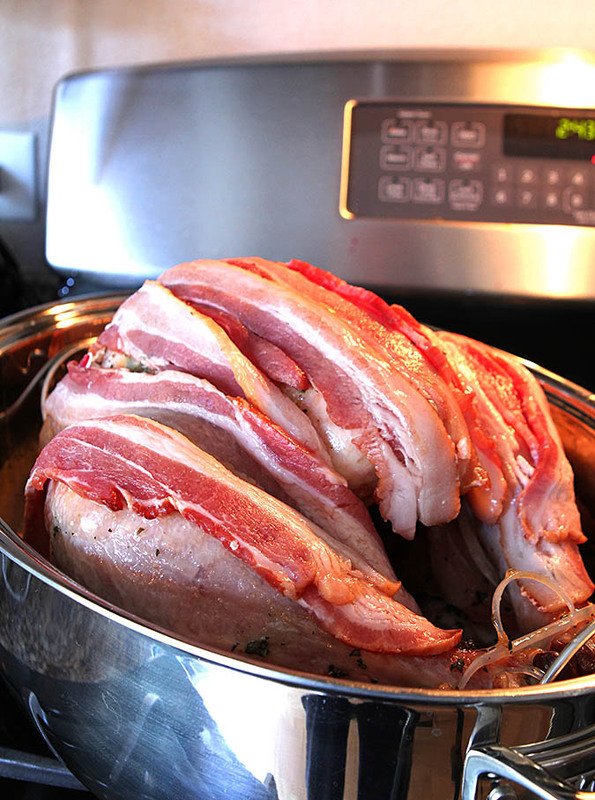 I don’t stuff the bird; preferring to have to cook faster so I have a process; the bird comes out of the oven, the bacon is chopped and added to the stuffing which is then put into the oven while the turkey rests and is carved. I long ago gave up the tradition of bringing a whole bird to the table; we carve it and present it on a platter that makes serving it at the table so much easier. Still slicing your turkey breast into thin slices? Try my technique of carving out the entire breast sections and then slicing them crosswise into thick steaks; cutting across the grain makes for a more tender and juicy piece of meat. When the bird is done, that combination of stock, turkey drippings, maple syrup and bacon make for a gravy that is simply unbelievable, especially with the cornbread stuffing. I know…you want some right now don’t you? No post about this years turkey would be complete without my bragging a bit about my new toy. Yes, that’s right…cooking gadgets and utensils are every bit the cooks toy as skis are to someone else; they bring joy to us in their use and when they are both functional and gorgeous it’s simply the best of both worlds. 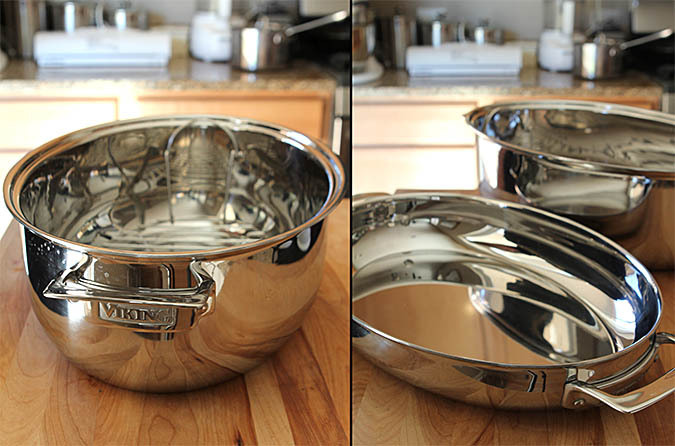 When the kind people at Viking Ranges wondered if I would like to feature their latest (and greatest), this Viking 9 quart Oval Roaster with Metal Induction Lid & Rack, I was all ears. I still had not found my turkey roaster that had gone errant when I moved almost 2 years ago and it was time to give up hope. The name Viking certainly has the cache of excellence so I was excited about working with them. When I thought roasting pan, I was picturing my old roaster in my mind; a large rectangular unit with a rack. Period. So I was not completely prepared for this beauty. The large oval roaster could have easily managed a much larger bird than the eleven-pounder I put to the test. Reversing the rack would prop a bird up a bit higher too allowing for more space but for my needs, I decided to cook it with the rack resting on the bottom; not hung from the sides and it was perfect. The top is something I might be most excited about though. Certainly a perfect fit for the bottom unit when it’s needed but the best part? It is also a separate unit that you can roast, bake and serve from. If I had been cooking for a large crowd it would have been perfect for my cornbread stuffing or my famous Creamy Mushroom Bake. While my previous roaster lived in the basement except for one day each year, this one will find it’s home upstairs, you know, where the uppity folks live! This year it was so handy to just remove the rack and make gravy while the bird rested. Once I carved the bird and put the gravy into a serving dish, I simply put the carcass and wings back into the pot with some chicken stock and water and covered it while I simmered those pieces for chicken soup. Perfect! Now if they would would just ask me to ‘try’ a range…ahh, that would be nirvana! With some great irony, I found my old roaster in a box with some towels two days after this one was delivered. I’m sure a daughter must be in need because it’s now been relegated to the garage until I decide it’s fate. Ready to make your own switch to something not just practical but beautiful too? Viking has you covered; I seriously love this roaster! While I may not be staying home and cooking for Thanksgiving Day, I have sure enjoyed this meal this week. I’ll be sharing a recipe for the Herb Roasted Carrots with Honey on Thursday and I’ve got a whole bunch of cranberry sauce recipes too. This was the perfect meal. The only thing left? Dessert. This Bourbon Pumpkin Pie…it will change the mind of any ‘I don’t like pumpkin pie people!’ I hope you try this turkey but more than that I wish all of you a happy and blessed holiday season filled with good friends, good food and of course…good cocktails. Cheers! The most amazing turkey I have ever had! Tender, juicy and fabulous flavor. Remove the neck and gizzards from the inside of the turkey and set aside. Rinse the bird thoroughly inside and out with cold water and pat dry. Sprinkle the cavity and skin liberally with salt and pepper. Using your fingers, gently lift the skin from the breast and legs, and slip pieces of the sage butter underneath; massaging it in as you go. Truss the turkey; place it on a rack in a large roasting pan, pour 2 cups of chicken stock into the bottom of a roaster and put it into the oven (replenish the stock as needed to keep liquid in bottom of pan to keep the combination of maple and bacon drippings from burning. In a small mixing bowl, whisk together the maple syrup and hot water to thin the glaze out a bit; use this to baste the turkey every 30 minutes. The turkey should take 2.5 to 3 hours to cook (i.e. 15 to 20 minutes per pound.) If the legs or breast brown too quickly, cover with foil. About 2 hours into cooking, shingle the strips of bacon oven the turkey breast to cover; continue to roast and baste for another hour or so. The turkey is done when an instant-read thermometer inserted into the meatiest part of the thigh registers 160 (the turkey will continue to cook while it rests and should get to 165 degrees F (the thigh juices will also run clear when pricked with a knife.) Transfer the turkey to a cutting board and let rest for 20 minutes before carving, so the juices can settle back into the meat. 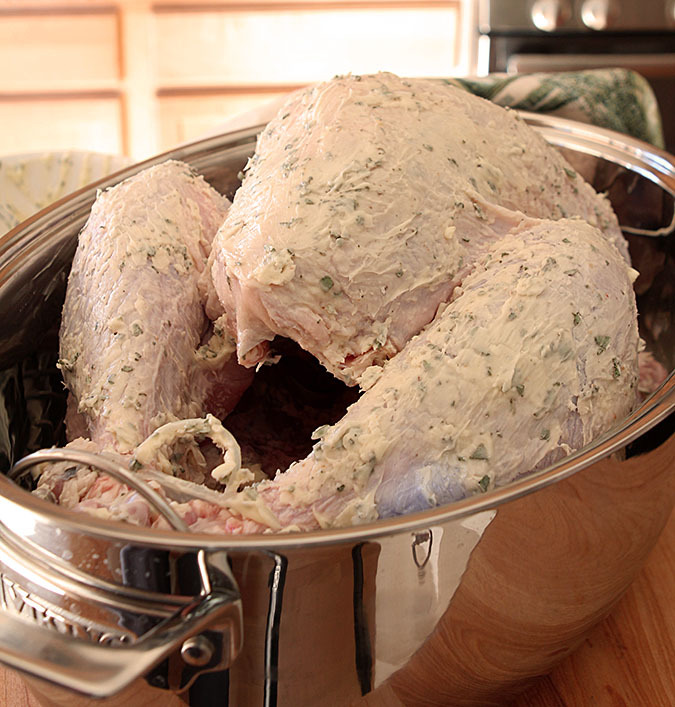 Take the turkey out of the oven to rest for 15-20 minutes before carving. Abouit 15 minutes before the turkey is to be removed from the oven, make the cornbread batter. In a sauté pan, melt 4 tablespoons of the sage butter, add the onions and garlic and cook for 15 minutes until soft and golden. Remove from heat. Put the cornbread in a large mixing bowl and scrape the sautéed onion mixture on top. Add the egg, heavy cream, bacon pieces and just enough chicken stock to moisten the stuffing without making it soggy (about 1/2 cup.) Toss well to combine, season with salt and pepper. Set aside. 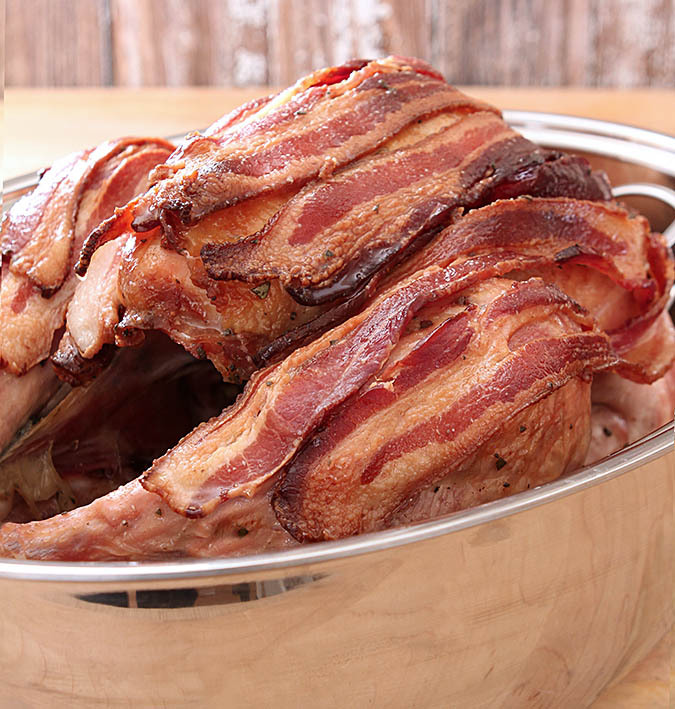 Once the turkey is taken out of the oven, remove the bacon and chop half of it into bite size pieces; reserving the other half for garnish. Add the bacon to the cornbread mixture and put the mixture into a greased 13X9-inch inch baking pan. Put the cornbread stuffing into the oven when you remove the turkey and bake for 20-25 minutes until cooked through and crispy on top. Skim off the excess fat from the pan drippings with a spoon; saving 4 Tbsp of fat for the gravy. Strain the liquid through a mesh strainer into a large measuring cup or bowl. Place the roasting pan over 2 burners set on medium-high heat. Add the 4 Tbsp fat drippings that you reserved and stir until melted. Whisk the flour into the fat and let cook for one minute. Add the liquid from the pan (chicken stock, drippings and maple syrup mixture; should measure 4 cups, if not add additional chicken stock) and whisk into the flour. Bring to a simmer; season with salt and pepper and hit it with a squeeze of lemon juice to brighten the flavor. Add the milk and white wine and simmer for 5 minutes. Add the cooked giblets if using and stir to combine. Serve the gravy with the maple-roasted turkey and cornbread stuffing. If you want to use the giblets in the gravy, remove and rinse them well and then bring them to a simmer in a pan covered with water that you have added 2 stalks celery, 2 carrots and one small onion to, all rough chopped. Season the stock with salt and pepper and cook on low for one hour. Remove them from the stock and discard all but the heart and liver. Finely dice and add to the gravy. I have been compensated for featuring Canadian Maple Syrup and Viking cookware in this post however all commentary is my own. This was a delicious turkey. A nice change from the traditional flavor. I stuffed this with the “Awesome Sausage Apple and Cranberry Stuffing” from this site and this made the best Turkey and stuffing I’ve ever eaten. I’ll be making it again. It is amazing isn’t it? So pleased you enjoyed it too! Oh my, the butter rub, the bacon, the maple, the fresh sage! Can I come to your house for Thanksgiving this year? I think my family would understand the reason for ditching them. I can understand why this turkey is an annual tradition, I wouldn’t change a thing about it. Yes yes yes! This turkey looks divine and your photos are truly beautiful. Seeing this makes me even more ready for thanksgiving. Beautiful! What an incredibly delicious and flavorful turkey! The bacon, the sage and maple syrup sounds like the best combination! I have sent the link to my mother-in-law in hopes that she will make it for Thanksgiving. Looks like a crowd pleaser for sure! Yummy! I am drooling in a major way over here! That turkey is absolutely perfect. This is a gorgeous feast! I love adding maple syrup to just about anything possible! I love maple syrup. Growing up we always had the fake stuff (I know!) but then I moved to NY and NO ONE uses fake maple syrup and now I know why. 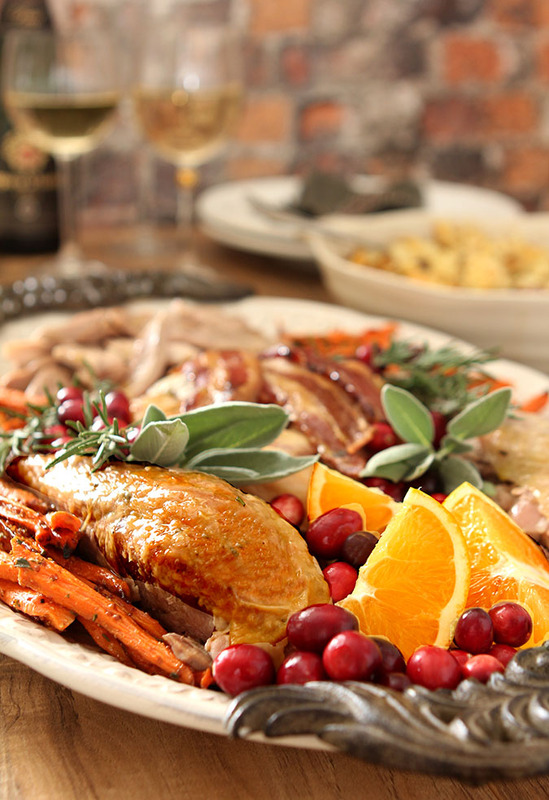 It’s so perfectly sweet and works perfectly with this turkey…yum! Maple syrup is such good stuff, isn’t it? We have bought the imitation kind in decades — it just has no flavor. Anyway, what a great turkey recipe! I can see why it’s become one of your favorites. Just a note, I mix a stick of butter with my fresh chopped rosemary-it too is hardy here in Indiana this time of year, then I lift the breast skin up ever so gently and rub the breast under neath with this flavored butter. It melts all over and the result is delish. I find it also keeps the skin from getting to dark as it used to when I buttered on top. Tx for your recipes. That’s what I do with this turkey too although I use sage. I grown a large sage bush all year long just to have fresh sage for this turkey! My rosemary is still going in a pot but I fear that will soon be over; a hard freeze here in Colorado will do it in. A sad day for me for sure. Ok, you convinced me to make this next time I do a turkey! That just looks amazing. I have saved the recipe and will for sure give it a go! Simone I am not lying; just the best turkey ever. The gravy that is produced as a result of having some maple syrup and bacon drippings is also just to die for…particularly with cornbread stuffing. I’m craving it again now! I’ve decided to just come to your house for Thanksgiving. Yep. Now that’s how you do turkey! Man, cornbread stuffing AND bacon wrapped? Yes! Yes, yes and yes.It is soooooo good. The gravy with a hint of maple on that cornbread stuffing…well, now I’m making my own mouth water. He..he .. and I thought I’d found the perfect turkey recipe!! After reading this I am more than happy to admit defeat.. this sounds absolutely amazing! Yes, putting some stock in the bottom of the pan is the secret to not having the drippings burn – have to remind my cousin to do that this year so that I have something to make the gravy with!! Oh, and Barb? Next year I am coming to your house for Turkey day ok??? Yes please. I called my daughter’s boss today and I’m bring dinner for the whole crew on Wednesday night…I had to cook for Thanksgiving and this bird will get made after all. Can we say Yay!?? YES, bring on the bacon 🙂 and the turkey! Looks wonderful! What a gorgeous turkey! I can’t imagine anything better than a bacon-flavored bird. Isn’t it great that the fresh sage is still flourishing in this cold weather? I’m using it as much as possible. Thanks Dara…it is always amazing. I love fresh sage and I’ve decided the reason it is so predominant in turkey is because it is hardy through the first cold; I always have some fresh that I can pick on Thanksgiving…going into December the cold does it in. Our ancestors must have discovered the same thing, right? Um, wow! That’s about all I can say for this one. Yum and wow. I made this turkey yesterday for Thanksgiving. By far the best turkey we’ve ever tasted. I added fresh Rosemary in addition to the fresh sage butter. The turkey was so moist, incredible flavor from the maple syrup and bacon. I worried at first about not greasing the outside of the turkey. But the salt, pepper & maple syrup was all it needed. Then you put the bacon on top for the last hour. The aroma was fantastic, and a minor brawl ensued over who would get to eat the maple roasted bacon. OMG!!! I found thick sliced maple bacon to use. I was tempted to use more syrup, but 1 cup was plenty. If I added more, the gravy would have been too sweet. I used my stuffing recipe from last year, which is: 1 box Stovetop cornbread, 2 stalks celery, 1 onion, chopped dates, few slices mild jalapeño chopped fine, broth to soften, 2 eggs to bind. 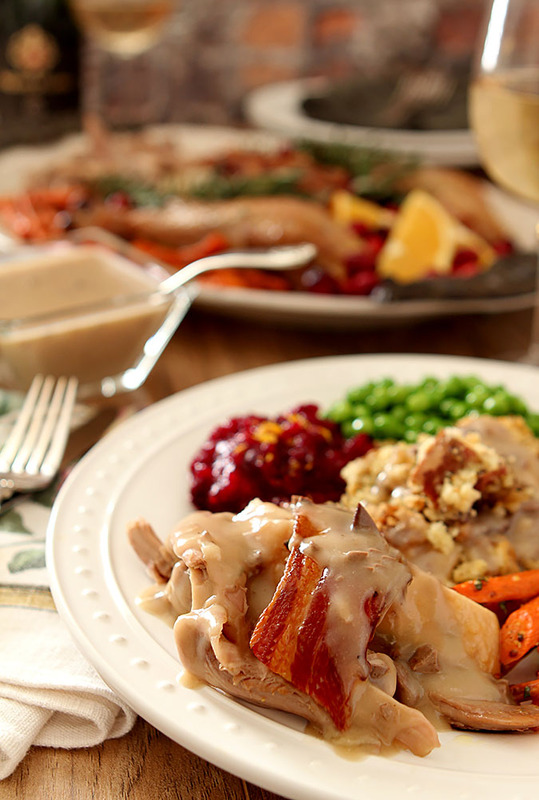 Maple gravy on this stuffing was divine! Thank you for incredible recipes that will become family traditions! So glad to hear you loved it too; our all time favorite. We tried jalapeno in the cornbread last year but this year in lieu of fights over the bacon, I chopped it up and put it in the stuffing; our turkey comes out and sits while we bake the stuffing and some sides. The addition of rosemary sounds great and I’ll try that next time. Next year! You’re right about the syrup; since it does flavor the gravy; anymore would affect it adversely but it’s the yummiest gravy ever with that bacon/maple thing going on…yum, and right now craving and thankful for LEFTOVERS! Thanks for the clarification. I thought I had to make the cornbread from scratch. We can’t wait to try it. By the way, your table is simply beautiful. Yes, the cornbread recipe is included in the instructions for the turkey; it’s all here! It looks amazing and so delicious. I just might try this for our Christmas this year! Oh my god this looks and sounds amazing! I’ve been making the same brined turkey every year and while it’s delicious, it might be time to try something new. And this recipe could very well be it. We just absolutely love this…on top of the great turkey, the combination of a gravy with a subtle maple flavoring on top of that cornbread. Oh my, now wishing Thanksgiving were closer! Try it, you’ll like it!